A must-try for the 100% lovers. Menakao’s bar packs far more of a punch than Akesson’s and Pralus’ more mellow Madagascan 100% bars. This award winning dark bar is an intense 100% Madagascan dark chocolate. The bar has no sugar in it at all and is made with nothing but cacao, revealing all of the richness of the cocoa. Unwrap the chocolate and you are instantly hit by a strong fruity aroma. Delicious and inviting as this may be, don’t be fooled into breaking off a great chunk as this chocolate has a serious intensity! The initial berries have a citrus edge, leading to a powerful and sharp finish. A roasted note is mixed with the fruits, which reminds us a little of strong filter coffee. The almost sherbet – like astringency, gives a mouth-watering quality as the chocolate fills your mouth with strong flavours. 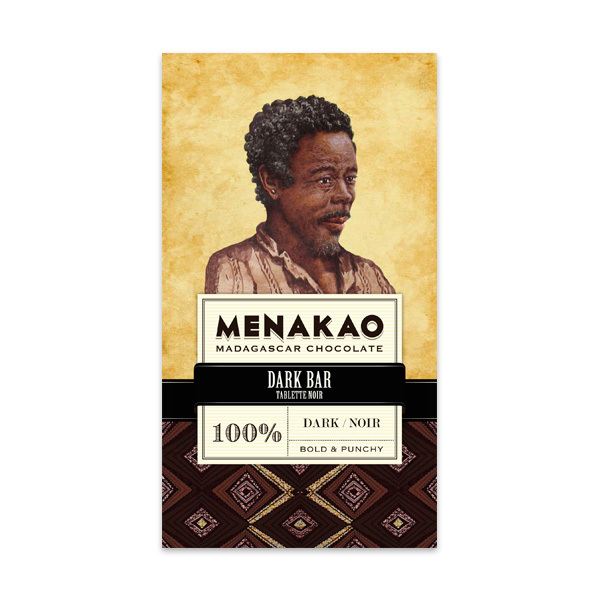 In honour of the men and women of Madagascar of all ethnicities who are at the heart of Menakao chocolate, Menakao decided that the bars should proudly bear the image “not [of] the face of Madagascar, but [of] Madagascan faces.” The beautiful image on the wrapping of this bar is of a Betsimisaraka man. The Betsimisarka (Betsimisaraka meaning “many and inseparable”), are celebrated for their rhythmic dancing traditions and are the largest group on the east coast of Madagascar, a region noted for lush vegetation, dense forest and tropical climate. I was initially dissuaded from buying this because of the negative reviews, but as I love Menakao's 80 percent and am a 100% fan, I finally bought a bar and I'm so glad I did. It's amazing! It has a wonderfully powerful roasted cacao flavour which is quite savoury, tempered by a gorgeous citrus sweet edge. Its my new favourite 100% bar! Like Dina A said it is a strong bold chocolate Personally I like the creamer one like Bonnat I'm a relatively newbie with 100% cocoa - so the older hands may taste things I'm not ??? We've been rating our bars on our regular deliveries for the past 6 months now, this bar scored the worst of all the bars we've tried. The high percentage of cocoa stops adding complexity and flavour and tips the scale firmly into the bitter and unpleasant zone. It's just too much. We used half the bar in cooking, it wasn't a nice experience as chocolate in its own right. This is a strong, bold 100% bar, the highly roasted tones and that strong citrus aftertaste mean one piece is enough for me. Unfortunately I just find it too acidic and not fruity enough for my liking for a high percentage cocoa content.